I scream you scream we all scream for ice cream! Who can resist a frosty scoop of homemade strawberry ice cream atop a crispy, crunchy ice cream cone? Sounds pretty good to me right about now. This sweet project whips up in no time and can be used so many ways. You can sew this fat-free cone on a little girl’s dress or a baby’s blanket. You could stitch two together to make a little pouch for candies. Make several and sew them together to make a darling light scarf. You can also switch up the flavor appeal by changing the colors of the cones crowing glory. 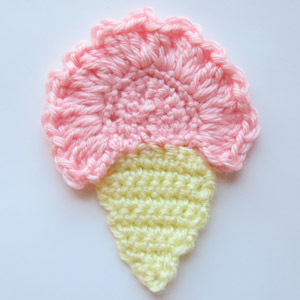 Starting with the scoop of ice cream, bring the right and left straight ends together and whip stitch the center seam using pink yarn and a tapestry needle. Now, whip stitch ice cream onto the cone and weave in loose ends. Need help with this project? Jot your question below and I’ll get back with you! This entry was posted on Wednesday, February 29th, 2012 at 10:15 AM by Emilee Gettle	and is filed under Free Crochet Patterns. You can follow any responses to this entry through the RSS 2.0 feed. You can skip to the end and leave a response. Pinging is currently not allowed. I LOVE this project, especially the ruffled ice cream and how you used it to accent the cone! Sweet!! so cute……thanks for the pattern!! Too cute! Thanks for the pattern! I think I’ll make a banner with these! I just made this cute ice cream cone, and it looks adorable! Thank you for sharing such a cute pattern. Please have a look at the Picture. That ice cream pattern is pretty cool. My daughter would love it!